Short but great little album by Gemma Ray. It only runs for 27:27, but you can just hit repeat and have it run in a loop. All songs feel very connected anyway. Her last album "Island Fire" was a true masterpiece of retro-pop. It felt like a refreshing cold drink on a tropical island. This new album feels more like a slightly dark and weird western soundtrack or fantasy. The music is very dreamy and all songs melt together. "Down Baby Down" is a line used in several of the songs. Not all songs have lyrics though as several of them are purely instrumental. Gemma's guitar is twanging it's way through the album's 10 songs of jazz-noir, gothic folk and fucked-up rock’n’roll as I've seen it described. I have had the record on repeat all day and I really love it. 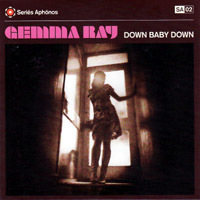 Gemma Ray is quite often being compared to PJ Harvey. It is a bit unfair, I think. Gemma is totally her own and she is a truly talented and much underrated songwriter and musician. Gemma was joined by Thomas Wydler [of Nick Cave and the Bad Seeds], Rory More and Wilhelm Stegmeier in a studio in Berlin. The record is a fully analog recording and it sounds really great on vinyl. The vinyl album even comes with a free cd. Gemma Ray - Island Fire ♦ Gemma Ray : "The Exodus Suite" ♦ Gemma Ray : "Psychogeology"